A couple of months ago YNAB suddenly replied it could not import my .csv file anymore since it wasn't formatted correctly. After trying a bunch i desperately opened the example file to copy the column headers to see if that would work. Low and behold the headers had changed!!!! for some reason ynab decided it wanted a new format to import. As I thought I might have missed an update or news report I started searching for anything about this new format and why ynab had changed. Since I'm located in europe my bank isn't listed as autoimport so I'm using an old tool for classic ynab to convert my banks csv to ynab csv. Not being able to use this tool creates a lot of hassle for me. Since I was in a hurry back then i just changed everything in excel and fixed the rest by hand in ynab. However, 2 weeks after it was time for some importing again and I searched for the new column headers but couldn't find them anymore. So I uploaded the "wrongly" formatted csv to force the app to give me the new headers. Low and behold, ynab just accepted it! apparently, it only wanted a different format just that time. I guessed it was developer error and they quickly rewinded the decision to change the format. I was really glad. my converter was working and I have been happily budgeting again ever since. Today it asked for the dreaded new column headers again and I'm pulling my hair out why this is happening to me. I can't find anything on the website or the forums. All the knowledge pages still show the old format as does any recommended external converting tool. Does anyone please know what's happening? Hi Powder Blue Sound ! I'm sorry you've been having trouble with File Based Importing! I'm happy to help. We haven't made any changes to the .CSV formatting requirements. Importing CSV files is our last resort option, because there isn't an industry standard format, and they need to be formatted just right. It sounds like your bank might have made some changes to how they display that information? You'll want to double check with them. Here's a 3-line example of how a CSV file needs to be formatted. The first line is the header, the second line is an example outflow, and the last line is an example inflow. You'll notice every field is separated by a comma so it's important that every field is present in each line, even if your transactions don't fill every field. Always include the "Date,Payee,Memo,Outflow,Inflow" header line at the very top. Any field can be left blank except the date. 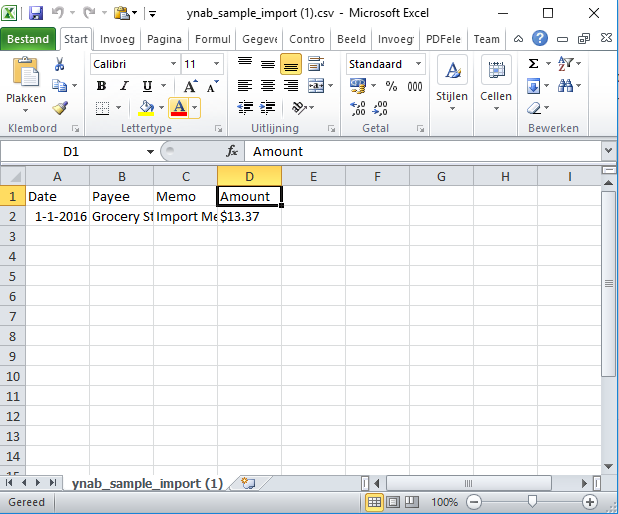 In a spreadsheet program, it would look like the screenshot below. Just make sure the file extension is saved as .csv! A fellow YNABer created this (unofficial) CSV converter which may help convert your CSV file from your bank into the format above. Is that the one you've been using? You're welcome to give it a try! We aren't able to support it if it doesn't work for your bank's particular format, though. I hope that helps! Let me know if you still have questions! where the amount needs to be negative when dealing with outflow. As of why and how this is happening to me. I have zero clue. To add insult to injury, now (on a different laptop) it's working as it should again so I can't add a screenshot of this happening right now. I will post some when I open the other laptop again. I found the problem. The converter cut out halfway through a transaction where it's leaving the in and out flow empty. Apparently, ynab doesn't like this. After deleting that specific entry It does upload. Powder Blue Sound Can you let us know where you're getting that example file from? When you import, does it accept both the original and "new" format? It sounds like the program won't accept the error you mentioned, so is accepting a slightly modified version Or the original.